It’s important to have a leader that will stay motivated until the end of the campaign. They should be organized and have good communication skills to ensure everyone is kept informed and energized. For larger groups of young people, it is desirable to have adult volunteers to assist the leader. The assistants can help with receiving and distributing the chocolate. If necessary, they can also help with contacting participants during the campaign. It is also important to have one person who is responsible for collecting the money. That can be done by the leader or someone appointed by them. Knowing how much money you would like to raise makes it easier to determine which products to sell. When working with WFC, it also helps you determine how many cases to order. Setting a specific goal also motivates the participants in the campaign to sell to their highest potential. A Fundraising campaign can be run almost any time. Generally, if the campaign is to raise money for team or group activities, it is best to run the campaign at the beginning of the season, this is when participation and enthusiasm are typically the highest and your results should reflect this. The length of your campaign can vary depending on your objectives and the motivation of the fundraisers. Campaigns don’t have to be long to be successful. Typically, a campaign that runs 2 to 4 weeks can be very effective. By setting a specific beginning date and ending date for your fundraiser, it is easier to generate and maintain enthusiasm. For the best results, make sure the event is the primary focus of attention! 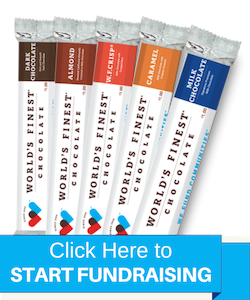 Our hands-on fundraising specialists at World’s Finest® Chocolate ensure the success of your fundraiser by informing you of the best-selling products in your area. You will be referred to one of our passionate and experienced local sales representatives, who will design the perfect program to fit the needs of your organization. Sales representatives are also helpful to experienced fundraising coordinators because they often offer prize incentives and special promotions.